Mars "is the fourth planet from the Sun and the second smallest planet in the Solar System, after Mercury. Named after the Roman god of war, it is often referred to as the "Red Planet" because the iron oxide prevalent on its surface gives it a reddish appearance. Mars is a terrestrial planet with a thin atmosphere, having surface features reminiscent both of the impact craters of the Moon and the valleys, deserts, and polar ice caps of Earth." "European researchers say a Mars explorer has provided the first evidence of a huge groundwater system that once existed deep inside the Red Planet." "On Wednesday, after seven months during which NASA was unable to establish contact with the machine, its 15-year mission was declared complete." "The US space agency's (Nasa) InSight mission has reached a new milestone in its quest to understand the interior of the Red Planet." "This illustration made available by NASA in 2018 shows the InSight lander drilling into Mars." "British scientists are launching a daring mission to Mars to bring back samples of Martian soil which could prove that life once existed on the Red Planet. In 2020, Nasa’s new rover will land on Mars and begin drilling down into the surface for core samples." "Nasa's Mars2020 rover is the first to be equipped with a drill to take samples of the surface." "NASA says its Mars vehicle has discovered carbon-based substances that support the case that life could have existed on the red planet. Scientists reported NASA’s Curiosity rover found possible building blocks of life in an ancient lakebed." "The small, autonomous rotorcraft will travel with the agency’s Mars 2020 rover mission, currently scheduled to launch in July 2020, Nasa announced on Friday. The mission is designed to demonstrate the viability and potential of heavier-than-air vehicles on the Red Planet." "NASA is sending a robotic scientist to dig deeper than ever before, to study the planet’s geological activity." "So, here it is. Europe's Mars rover. Or rather, a copy of it." + Sky At Night: Mars - Red and Dead? "Nasa's Curiosity rover, also known as the Mars Science Laboratory (MSL), is celebrating 2,000 martian days (sols) investigating Gale Crater on the Red Planet. In that time, the robot has made some remarkable observations. Here are just a few of them, chosen by the Curiosity science team." "Elon Musk, a man prone to ludicrous deadlines, has birthed another: test flights of his Mars spaceship next year." "Founder of SpaceX, which is working on getting humans to the planet, speaks at SXSW amid rising nuclear tension"
"The desert in Oman looks so much like Mars that more than 200 scientists chose it as a place to field-test technology for use on Mars." for use in a future Mars mission in the Dhofar desert of southern Oman. "Researchers with the U.S. space agency NASA and the Department of Energy have announced successful tests of a very small nuclear power system. The device could change the future of space exploration." "Humans could travel to Mars as early as 2024 with the aim of building a colony on the red planet, Elon Musk has claimed." "Musk says project codenamed BFR would also allow commercial travel to anywhere on Earth in under an hour." "Elon Musk gives an update on the progress SpaceX, his commercial space agency, is making on interplanetary space travel. Musk tells the audience that he believes a cargo mission to Mars will be possible by 2022, with a manned mission following in 2024. He envisages the creation of an inhabited city on the planet, with up to 100 people able to travel to the base per trip." "Discovery has major implications for hunt for alien life on the red planet as it means any evidence is likely to be buried deep underground." "He said that a huge Martian city could be established this century , which would not just be an outpost , but a fully functioning society with ‘iron foundries and pizza joints’." "Getting humans to Mars is now an official goal of NASA, the American space agency. A new U.S. law gives more money to the agency. But getting to Mars means having to deal with damaging radiation in space. Scientists are looking at ways to protect astronauts." "NASA, the American space agency, is developing new food products for astronauts to eat in space. The agency will need such products for its planned mission to the planet Mars. In about four years, American astronauts will be traveling into deep space, beyond the moon." – giving hope that settlers could grow food." "New pictures are most detailed images of Mars ever achieved from an orbiting spacecraft and seem to add weight to theory on Beagle 2’s final resting place." Researchers say discovery of stains from summertime flows down cliffs and crater walls increases chance of finding life on red planet. "If setting up home on another planet sounds a daunting prospect, then our space correspondent Richard Hollingham is here to help. And in the video above, former astronaut Jeff Hoffman describes his project to bring oxygen to Mars." "A Dutch organisation, Mars One, is seeking volunteers for a flight that would take them to the Red Planet and leave them there. The costs would be covered, it's hoped, by TV rights and corporate sponsorship." "Spirit's been roving on Mars for more than six years. Ten months ago, she got trapped in sand, and since then, although there has been fascinating science performed from her parking spot, the mission's main goal has been to try to get her out..."
This infographic depicts the suspenseful 7 minutes it takes for Curiosity (Mars Science Laboratory) to get from the top of Mars' atmosphere to its surface." Phoenix "was a robotic spacecraft on a space exploration mission on Mars under the Mars Scout Program. The Phoenix lander descended on Mars on May 25, 2008. Mission scientists used instruments aboard the lander to search for environments suitable for microbial life on Mars, and to research the history of water there. The total mission cost was about US $386 million, which includes cost of the launch." "Recent data about our planet neighbor Mars helps NASA plan for getting humans there by the 2030s. The discovery of liquid water on the planet could change the way we see our solar system. But there is still much more than needs to be known before people can safely go to Mars." "NASA has found salt minerals that provide strong evidence that there was liquid water on Mars. NASA has found lines of "hydrated" salt minerals on Mars. Scientists say these minerals would require liquid water to be created. And where there’s liquid water, they say, there could be life." "It is a dream as old as man; to travel through space and discover what lies on other planets, and beyond. Recently a group gathered in Washington to discuss putting humans on Mars. NASA Administrator Charles Bolden says the agency is on track to land people on Mars in the 2030s." "Scientists have discovered new things about the atmosphere and environment on Mars." " Researchers from the U.S. space agency NASA are currently trying to find out what kind of plants could grow in the red soil on Mars." One-way ticket to Mars: Any volunteers? Cartoon: Is There Life on Mars? "Fictional representations of Mars have been popular for over a century. Interest in Mars has been stimulated by the planet's dramatic red color, by early scientific speculations that its surface conditions might be capable of supporting life, and by the possibility that Mars could be colonized by humans in the future. Almost as popular as stories about Mars are stories about Martians engaging in activity (frequently invasions) away from their home planet. In the 20th century, actual spaceflights to the planet Mars, including seminal events such as the landing of the first mechanized device to successfully operate on Mars in 1976 (in the Viking program), inspired a great deal of interest in Mars-related fiction. Exploration of the planet has continued in the 21st century on to the present day." "The first of a series of films called 'Five minute masterminds' starts with Prof Martin Rees, the astronomer royal. He asks how the future of space exploration will transform how we think of humanity and if we can rely on mass emigration to Mars to save us from the Earth's problems"
"The NASA Mars lander InSight streaked into the planet's thin atmosphere on Monday and successfully landed ahead of a two-year mission to explore the Red Planet's interior. InSight is the first geological mission to Mars, and over two years it will measure seismic activity, measure the planet’s magnetic field and take Mars's interior temperature." "After seven months and 300 million miles, NASA’s InSight spacecraft touched down on Mars. The suspenseful landing was NASA’s first touchdown on the Red Planet in six years." "It looks like something out of a sci-fi film. But this is the desert where scientists and volunteers test pressure-simulating suits in the inhospitable conditions of the Oman desert to prepare for life on Mars." "If you get fired from your graphic design job here on Earth it's not the end of the world because there are plenty of other job opportunities out there for you, especially if you have an impressive portfolio. But if you get fired from your job on Mars you're pretty much screwed, as Jeff the graphic designer discovered in this aptly titled animated short “Fired On Mars” by Nate Sherman and Nick Vokey. (Barely NSFW due to language)." "Elon Musk believes people will be sent to Mars in 2024." Elon Reeve Musk (/ˈiːlɒn ˈmʌsk/; born June 28, 1971) "is a South African-born Canadian-American business magnate, engineer, and investor. He is the founder, CEO and CTO of SpaceX; co-founder, CEO and product architect of Tesla Motors; chairman of SolarCity, co-chairman of OpenAI; co-founder of Zip2; and co-founder of PayPal. As of April 2016, he has an estimated net worth of US$12.3 billion, making him the 68th wealthiest person in the US." He wants to be King of Mars." to avoid becoming “house cats” for vastly more intelligent robots." "Spirit, MER-A (Mars Exploration Rover -- A), is a robotic rover on Mars, active from 2004 to 2010. It was one of two rovers of NASA's ongoing Mars Exploration Rover Mission. It landed successfully on Mars at 04:35 Ground UTC on January 4, 2004, three weeks before its twin, Opportunity (MER-B), landed on the other side of the planet..."
"Marsha James and Anna Matteo talk about whether or not folks would take a one-way ticket to Mars." "Space tourist and Millionaire entrepreneur Dennis Tito unveils plans to send a couple to Mars in January 2018." If she gets through the latest round she'll spend the next 10 years training for the project. It aims to send teams of four to the red planet every two years from 2025 until 40 people are living there." "Results of the most detailed analysis of the Martian atmosphere suggests that more than four billion years ago it was quite similar to Earth." "The Mars One mission is a one-way ticket to the Red Planet. It’s scheduled for 2023, when the first group of 4 men and women will land on Mars. There, they’re expected to collect data, plant oxygen-producing vegetation and prepare the planet for human colonization. Despite the obvious dangers of this enterprise, over 200,000 people from around the world have applied..."
The Martian "is a 2015 American science fiction film directed by Ridley Scott and starring Matt Damon. 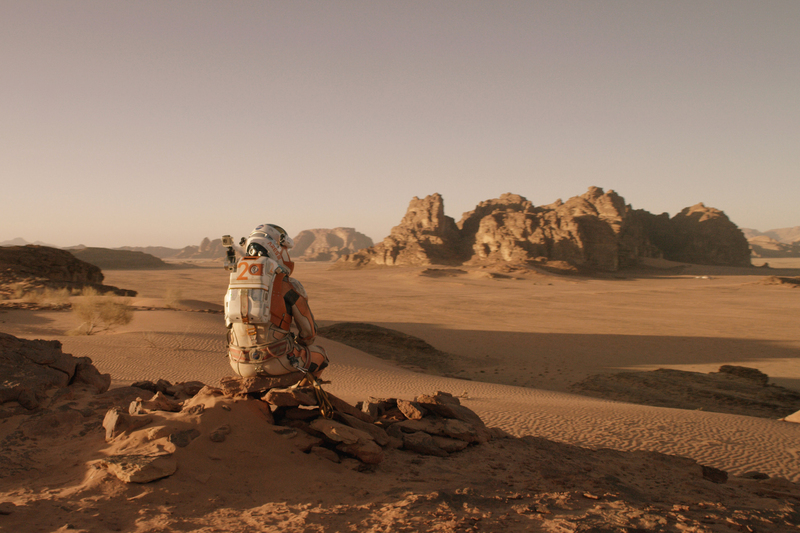 The film is based on Andy Weir's 2011 novel The Martian, which Drew Goddard adapted into a screenplay. Damon stars as an astronaut who is mistakenly presumed dead and left behind on Mars. The film depicts his struggle to survive and others' efforts to rescue him."